It’s one thing to say, “I want to get in shape in the next 12 months,” or “I’m going to write my first book in 2019!” But it’s another thing entirely to actually achieve potentially life-changing goals like these. The best way to actually achieve these kinds of goals, we’ve found, is to build small daily rituals that you’ll practice every single day (or at least every day you’re physically able to). A small daily ritual is a practice you regard as special, an activity not to be taken lightly, that you prioritize and set apart from the rest of your routine. It’s something you willingly surrender yourself to, not allowing yourself to reject the parts of it you dislike, but instead pushing forward and committing to the full experience for a short time each day. And of course, the small bits of progress you make each day add up to something big, and ultimately change the trajectory of your life. With a small daily ritual like this, you have a clear structure and a reliable sequence… and yet, you’ll still find yourself wanting to rebel. You’ll catch your willpower thrashing about sometimes, as you struggle with your habitual tendency to reach for the nearest distraction. This thrashing isn’t a bad thing though, because that’s where the most powerful growth process takes place—in the consistent practice of your small daily ritual, despite your inner rebellion. In the discomfort of staying in it for the long haul, you grow stronger and more self-disciplined with each passing day. Truly, a small daily ritual can be unimaginably transformative over time in more ways than one. And today, I’m challenging you to begin such a ritual first thing tomorrow morning. Lady Gaga keeps a journal. Oprah keeps a journal. Eminem keeps a journal. Needless to say, I learned the hard way, but YOU don’t have to. If you want to get somewhere in life, you need a map, and your journal is that map. It’s a place to capture significant thoughts. It’s a place to sort out where you’ve been and where you intend to go in the days, weeks, and months ahead. And it’s one of the most underused, yet incredibly effective personal development tools available to the masses. So, I’m challenging YOU to wake up tomorrow morning and get started (or continue) with journaling, consistently, for the next 19 days leading into the first few weeks of the New Year. I’ve listed 19 journal prompts below (which are also excerpts from our New York Times bestselling book) that I’ve personally used in the past to nudge myself into growth-oriented self-reflection. These prompts will bring awareness to the beliefs and assumptions you have. And they will help you think through situations, big and small, and make better decisions going forward. What’s one hard lesson you’re grateful life taught you in the past year? As human beings we are constantly outgrowing what we once thought we couldn’t live without, and falling in love with what we didn’t even know we wanted. Life literally keeps leading us on journeys we would never go on if it were up to us. Don’t be afraid. Have faith. Find the lessons. Trust the journey. If you don’t allow yourself to move past what happened, what was said, what was felt, you will look at your present and future through that same dirty lens and nothing will be able to focus your foggy judgment. Realize this. What you do now matters more than what happened yesterday. What’s one unchangeable reality you’re still holding on to and resisting? What can you do right now to ease your mind into the acceptance of this reality? Happiness is letting go of what you assume your life is supposed to be like right now, and sincerely appreciating it for everything that it is. So, RELAX. You are enough. You have enough. You do enough. Breathe deep… let go, and just live right now in this moment. Then, let your renewed presence fuel your next step. Who would you be, and what else would you see about your present life situation, if you removed the thought that’s been worrying you? When a flower doesn’t bloom properly, you fix the environment in which it grows, not the flower itself. The same is true for YOU. You can’t heal yourself in the same exact environment where you got sick. Realize this, respect this, and do your best to surround yourself with people and situations that push you to be your best. Less drama, less mess. Just higher vibrations and intentions, inside and out. How has your daily environment been affecting you recently? There are hundreds of people in every town on Earth who live their entire lives on the default settings, never realizing they can customize everything. Don’t be one of them. Don’t settle for the default settings in life. What’s one small example of how you have “customized” your life for the better? A big part of your life is a result of your choices. If you don’t like some part of your life, it’s time to start making changes and new choices. And it’s OK to be low-key about it. You don’t need to put everything on social media. Silently progress and let your actions speak for themselves in 2019. What have your actions over the past year been saying about how you prioritize your personal growth? What kind of silent progress would you like to make in your life by the end of 2019? If it entertains you now but will hurt you someday, it’s a distraction. Don’t settle. Don’t exchange what you want most for what’s easiest at the moment. Study your routines and habits. Figure out where your energy goes, and remove distractions. It’s time to focus on what matters. What’s one distraction that has been getting the best of you lately? Why? Get up. Make that call. Go on that date. Apply for that job. Start that side-hustle. Don’t be afraid of rejection, struggle or failing forward. There’s no shame in trying your best. Live, learn and grow through every risk you take towards inner growth and fulfillment. What’s one small risk you believe is worth taking in 2019? What’s the first step? Nothing big happens overnight. True progress takes time. Don’t give up because you can’t yet see the results of your labor. It can take months of focus and dedication to get outcomes you can actually see. You gotta believe even when the immediate results are invisible to the eye. What’s something big you’ve accomplished in the past that once seemed impossible? Life doesn’t want to give you pain, it wants you to grow and evolve. Repeated struggles aren’t punishment, they’re opportunities to demonstrate strength and progress. Anybody can talk about how strong they are, but life requires you to prove it. Prove that you are ready to level-up! Why are you ready to level-up in 2019? Why are you ready to make positive changes? Why is the journey in front of you worth the extra effort? Working hard is important, but rest is too. It’s tempting to fill in every waking minute of the day with tasks. Don’t do this to yourself. Leave space. The space between the things we do is just as important as the things we do. Your overarching goal in 2019 is living a life uncluttered by most of the things people fill their lives with, leaving you with space for what truly matters. A life that isn’t constant busyness, rushing and stress, but instead mindful contemplation, creation and connection with people and projects you truly need in your life. How can you give yourself a little extra time and space to make the right decisions on a daily basis? What’s one thing you would do differently if you knew no one would judge you? You can’t control how other people feel, or how they receive your energy. Anything you do or say gets filtered through a mindset occupied by whatever they are going through at the moment, which has nothing to do with you. Just keep doing your thing with as much love as possible. What’s one good, recent example of someone with a negative attitude completely misjudging you? How did you handle it, and what did you learn? When you guide somebody who is confused, when you hold somebody who is sad, when you hug somebody who has lost their hope, you too will feel yourself healing and growing stronger. So, no matter what has happened, or what happens today, let kindness be your superpower. Being extra kind to people is a peaceful way to live in each moment, and a beautiful legacy to leave behind in the long run. Who was the last person who was unexpectedly kind to you? What can you easily do to be a little kinder than usual today, and beyond? As you get older, what you look like on the outside becomes less and less of an issue, and who you are on the inside becomes the primary point of interest. You eventually realize that beauty has almost nothing to do with looks—it’s who you are as a human being, how you make others feel about themselves, and most importantly, how you feel about yourself. What makes your significant other (or someone else you love) truly beautiful on the inside? What make YOU truly beautiful on the inside? What’s something true about yourself that you need to embrace more openly and lovingly in the year ahead? Not as a prisoner to the false beliefs that sometimes keep you stuck in your seat. Instead, live in this world, on this day, and every day in 2019 as an active participant. Every morning, ask yourself what is real and important to you, and then find the courage, wisdom and willpower to build your day around your answer. …then it’s time to choose differently! Choose to let go of your false beliefs and stories. Choose to find strength in the truth—YOUR TRUTH—so you can take a real step forward every day for the rest of the year. If you’re feeling up to it, we would love to hear from you right now too. Which journal prompt above resonates with you the most today, and why? Anything else to share as we head into 2019? Thank you for sending this blog post to my email inbox today. I thoroughly enjoyed every prompt, especially since I have been journaling almost every day since this year began. My inspiration for journaling in 2018 came after I did a course related coaching call with Angel this past June. I resisted at first, but this ritual has given me so much clarity and awareness and has helped me get my power back during an especially challenging season of my life. As a mom to 4 amazing children, this daily ritual helps me stay focused, centered in the mind, and at my best. Looking forward to more progress in 2019 too. Happy New Year to all! New Year journaling! Thanks for the timely inspiration. I just finished my first journal entry. These journal prompts in a word: Elegant. EXCELLENT perspective and insight simply conveyed! Also, just bought two tickets to your Think Better Live Better event in San Diego! First timer here and I’m excited. And I’m excited to bring my daughter too. M & A, until I attended your 2018 thinklivebetter.com conference I honestly never thought about my daily rituals the way I do now–that what I do every single day either makes me or breaks me in the long term. Daily journaling as a ritual is such a good reminder, and pushes me to continue practicing what I’ve learned, in addition to cracking my journal back open for the first time in awhile in 2019. Just small, consistent actions that make my days better and my mind more sane. A year ago I never would have said such things. I just wanted everything to be simple and easier, rather than better and right. Thanks for the continued guidance. Also, just ordered your newest book on amazon. Congrats on making the New York Times list too. I didn’t realize that. Looking forward to reading it in the New Year. Cheers! Thank you for this blog this morning giving me a tool at the beginning of the year to live life differently in 2019, to do the most important activities that will change my trajectory. Prompt #8 about removing distractions spoke to me. This past year I have often used Facebook as a distraction. I am grateful for this awareness. Without yet doing your journaling prompts, I ALREADY know 4 daily rituals that I need to bring into my life: (1) Going to bed earlier and getting more sleep, (2) Walking an hour EVERY day, (3) Cutting back on starchy carbs and sweets, and (4) Giving myself more down time. Now it’s about bringing these daily rituals into my life, about doing them each day. These daily rituals begin TODAY. I look forward to seeing how my life changes when I begin the first 19 days of the New Year with these journaling prompts. Thank you for such a great motivation for the new year..!! ABout the journal prompts, I think I could relate with most of them and I actually need to answer them to know what I want from myself this year and start fresh. What an awesome post! And quite the coincidence too. It’s definitely #10 for me. Finally taking a big plunge in 2019. Hoping everything will go as planned. Happy New Year everyone! The one that resonates the most with me is happiness and that I am enough right now. I tend to be what if worrier. I have a hard time in the present but I did pick up a journal to start 2019 off with. 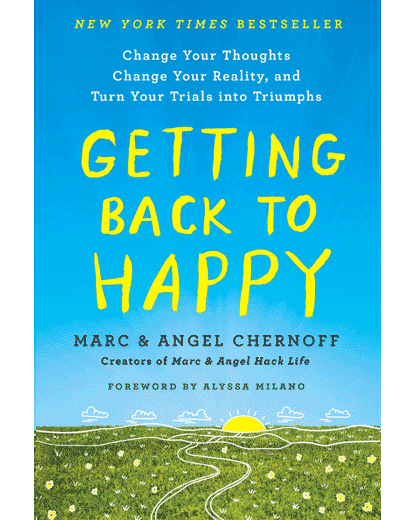 Thank you Marc and Angel your newsletters touch me and I am currently reading your book Getting Back To Happy, love it. What you do for people is priceless. No matter what age, you are teaching people what they don’t/didn’t learn in school. You teach them to use their “minds” to be the best they can everyday. You teach them how to think in a positive way to overcome the negativity that come their way. These 19 steps to establish the daily routine are invaluable. Thank you very much. Reading your newsletter each day and your book has made me begin to think about myself and my life. I definitely need a push and I am trying. I have never really thought about things in this perspective and am feeling a bit shallow now. Thank you for clarifying things…just need to follow now. Hehehe! I think I am one of them. I have lead such a kind of life for sometime. On a default setting! Taking everything as usual and considering everything normal but as we usher in this new year I am going to customize my own life. Well, let’s assume it’s very normal to live on a default setting up to early 20s as I am but thanks for the reminder cause I am going to a make a real change come next year, oh! , I mean as from tomorrow. Prompt #18 resonates with me. I teach Restorative yoga and I encourage my students to slow down and “be in the moment.” It sounds easy, but actually it can be difficult especially in today’s life of always doing via social media. I encourage my students to turn off their cell phone one day a week. Enjoy one day a week of no social media. Take a walk outside, enjoy drinking a cup of tea, the feeling of the warm cup in your hands, the aroma of the tea, noticing the sounds around you, using all of your senses. The present moment is the only time life exists. Don’t let life fly by without noticing the simple pleasures. Welcome to New Year 2019, everyone! It’s a worldwide celebration of the beginning of New Calendar Year, witnessed by all the nations globally. Blessings. Thank you for sharing such a beautiful content.